It’s time to put your thinking caps on and spark off the writer in you, for the most awaited Blog Fest of the year has arrived. Big Media Kart, India’s premiere media buying and advertising agency, is organizing a one-of-a-kind advertising and blog writing event this year – The AD Blog Fest 2019. The aim is to hunt down the best talent in the area and give them a chance to walk away with priceless accolades. 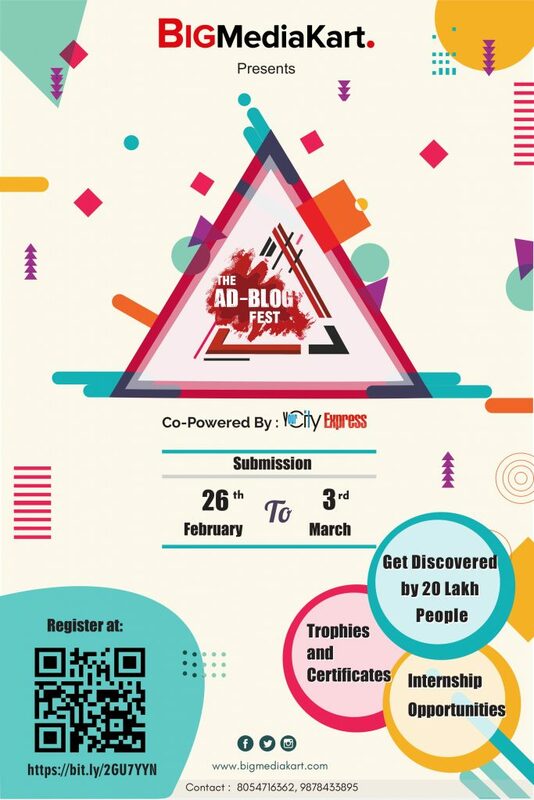 Scheduled in the month of February, the AD Blog fest, organized by Big Media Kart, will be one of the biggest blogging events in the region. The objective behind conducting the blog fest is to identify and nurture upcoming talent in the field of digital marketing, content writing, Strategy and Sales. If you ever wanted to be a digital marketer or have a profound passion for writing, you better be prepared to make the most of this remarkable opportunity. A golden opportunity to meet and interact with reputed CEO’s during the award ceremony. Rewards & Recognition at the grand award ceremony. Get Instant Fame: The top 6 entrants will be publicized to an audience of 15-20 lakh people on digital screens owned by BigMediaKart at Elante Mall,Chandigarh and Bestech Mall, Mohali. The top 6 entrants will be publicized in Your City Express Magazine, having a readership of 4 lakhs people. Certificate of Appreciation for the top 10 entries. Top 20 Blogs will be posted on Big Media Kart and our other social media platforms. As the name suggests, the theme of the AD-Blog fest 2019 is “Advertisement/Media-buying”. Students are required to choose any topic related to “advertising” and submit their blog on the same. Full creative freedom is given to the students to choose the topic. However, the topic should be relevant and related to the advertisement industry. Results will be announced in the Month of March. An online registration form will be floated on all the social media platforms of Big Media Kart in the month of February. The students are required to fill the google form and register themselves for the event. Once the registration process is over, the students will be given a 7-day window to write the blog and submit it online. The topic chosen should be relevant to the theme of the AD-Blog fest. Minimum word limit for the blog article is 750 words. Entries must be the original work of the entrant and not previously published elsewhere. Plagiarism, if found, will lead to immediate disqualification. using SEO on the blogs. Candidates must mention the references if used for quoting any quantitative data. issues are allowed. Images taken from google are not admissible. Font – Times New Roman, Font Size – 12, Line spacing – 1.5. The entries must be submitted in a .docx word file and should be mailed to events.bmk@gmail.com . Entrants must like Big Media Kart on Facebook and follow it on Instagram in order to be eligible. One entry per person. Bulk and/or third-party entries will be void. The entry should be 100% authentic and plagiarism free. All entries will be checked for plagiarism. Big Media Kart is the brainchild of UBS alumnus Mr. Gaurav Saini. He has been successfully working in the advertisement industry for over 10 years. Mr. Gaurav Saini is the founder and CEO of Red Stone Consultants and Redzo Media Pvt. Ltd. It is his vision that leads to the inception of Big Media Kart 1.5 years ago. Big Media Kart aims to be the preferred online platform for all the media-buying in the advertisement industry. Its motto “Simplified media-buying” is a testament to that. Big Media Kart is an online platform that allows business owners interested in advertising their products/services, to surf through various advertisement options available on the Big Media Kart website and chooses the one that generates the most revenue. In its short life span, Big Media Kart has successfully promoted innumerable products/services by efficient and captivating advertising, thereby maximizing sales/revenue for its clients. Big Media Kart specializes in the following type of advertisements. Transit Media advertising – Advertisement on Buses etc. Your City Express is a publishing house that settles for nothing less than excellence. It brings us great joy to announce that the winner of the blog fest will have their photographs published in the highly acclaimed Your City Express magazine. Since its inception in 2011, Your City Express has been the subject of prolific growth to become one of the leading publishing houses in North India. The elusive balance between content quality and content diversity that Your City Express magazines and newspapers strive to find makes them the best print medium in the cities they serve. Its readership of more than 4,00,000 is a testament to that very fact. Keeping in line with their mission of global reach, Your City Express Magazines and newspapers abide by international standards and provide world-class print medium quality. A unique, result oriented and fully transparent distribution system for advertisers has enabled Your City Express to reach the soaring heights, it is at today. Big Media Kart reserves the right to publish entries (including parts of entries) other than the winning entry and publication does not necessarily mean the entrant has won a prize. Big Media Kart reserves the right at any time to cancel, modify or supersede the competition (including altering prizes) if, in its sole discretion, a competition is not capable of being conducted as specified. Entrants not abiding with the instructions mentioned under “Eligibility Criteria” can be disqualified without any prior warning. Images used should be open source and without any copyright issues. Big Media Kart is not liable for any copyright infringement on the part of the entrant and will not get involved in copyright disputes. Once submitted, all rights of the blog will belong to Big Media Kart. Big Media Kart will have all rights to publish/modify the submitted blogs without any prior notice. Credits may or may not be given when published depending on the extent of modifications made to the blog. By entering the competition entrants warrant that all information submitted by them is true, current, and complete. Entrants also warrant that they are the copyright owners of any copyright works submitted, e.g. photographs and drawings, and Big Media Kart’s use of such works will not infringe the rights of any third party. Big Media Kart has full discretion to choose the winners.